uchchiyAl ERkum ugandhu = will be very gladly accepted, that too with HIS head! People who do not have any interest or stakes apart from Lord’s divine Feet (thiruvadi) do kainkaryam all the time to HIM. The Supreme Lord sriman nArAyaNaN does not mind mistakes, mishaps or any type of disorders in their kainkaryam. HE will gladly accept without any qualms and will be extremely pleased to see that HIS devotee is doing kainkaryam to HIM. HE will hold their kainkaryam in HIS head. 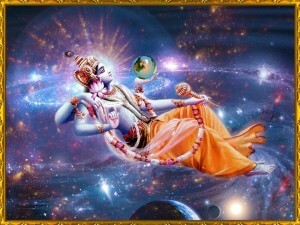 Lord krishnA, in bhagavad gIthA told arjunA “Hey arjunA!!! I take whatever MY devotee gives me with pure and untainted bhakti. Let that be a leaf, flower, fruit, water or whatever. I love whatever he gives with pure heart and I drink them immediately”. Since leaves and flowers are also included here, all it conveys is that what one gives does not matter at all. It is how he gives that would make Krishna’s heart happy. This is the essence of this pAsuram. muRRap buvanam ellAm uNda mugil vaNNan: During the times of cosmic deluge (praLayam), Lord sriman nArAyaNaN swallowed all the worlds in HIS stomach and protected them. Thus it is not destruction but only protection. Often times, we construe that to be destruction because it is not there in the place it was used to be. Since Lord had destroyed it from its immediate place, we try to see it as destruction. While in actuality, it is not destruction, as HE just protects them safely from where those worlds were born in the first place. He does it keeping in mind that it is HIS duty to do so and that HE does not expect anything in return, nor does HE does it for any other benefit. This nature of Lord is often times being compared with a dark rain bearing cloud that pours down heavily for prosperity. The clouds’s duty is to pour and it does not expect anything for doing so. The darker the clouds, the more rain it can give. Perumal is also dark hued in colour. This is a point of similarity. However, we should also note that clouds stop giving rain once all the darkness (impregnated water) is gone. But Perumal never does that and so we should remember this dissimilarity as well and take the spirit of the metaphor that is being referenced here. AzhvAr says “thAi irukkum vaNNamE ummai than vayitru iruthi uyya kondAn”, that means that perumAL was like a mother in saving and protecting. While the mother would protect her child, perumAL protects this whole universe which is HIS creation. The universe did not even know about this protection but even then perumAL did protect it because of the very connection that HE has on the universe. Does HE need any other reason to protect it? If a child is going near a well, the mother will automatically go and drag the child because the child is her creation and so it is her duty to protect the child by all means. Similarly, we are all HIS children and thus this very basic relationship is enough, if not any, for HIM to protect us during the times of cosmic deluge. By having this whole universe and its inhabitants including living and non-living things in HIS stomach, HE is the one who gets utmost satisfaction because HE is the owner of all of them and so HE feels immensely happy when everything is protected. There is no other benefit for HIM in doing this. Similarly, when a prapannan is doing kainkaryam, perumAL just relishes the fact that he is doing kainkaryam and ignores whatever mistakes he commits while doing it. kaRRaith thuzhAy sEr kazhal anRi: perumAL’s divine feet’s sweetness is being explored here. “thuzhAi” refers to tulasi plant. There is a difference between the tulasi that grows on the land and the one that went up to decorate perumAL. The latter is naturally way more fragrant than the former because of the contact it makes with perumAL’s body. Since it has got to its ultimate destination, there is nothing more left for it to do. It is serving under perumAL and so it attains height of happiness which is visible in its fragrance. So, prapannas, who go and surrender unto perumAL’s lotus feet that is being adorned with beautiful tulasi plant, will first of all be attracted by its sheer beauty, leave alone other characteristics of perumAL. HE is not only going to bowl over by HIS characteristics like sowlabhyam (ease of access), sowseelyam (ability of the HIGHEST to mix with the lowest like us) etc. Even before going to such qualities, beauty is the first thing that is visibly explicit and perumAL does not miss any opportunity to take our hearts away. He adorns HIMSELF with beautiful and fragrant tulasi. He shows his dark hued colour that is HIS best and natural colour that signifies “generosity”. He also shows HIMSELF with His Piraati. Swami madhuraKavi AzhvAr describes this as “kariya kOla thiru uru kANban nAn” in his kaNiNun siruthAmbu. “katrai thuzhAi sEr kazhal andRi” specifically refers to enjoyable nature of HIS divine feet. maRRonRai ichchiyA anbar: prapannas who do not desire anything apart from the lotus feet of sriman nArAyaNaN is what is being referred by this phrase. Majority of people today are those who ask perumAL for worldly benefits and enjoyments. In order to get them, they might do something that they think would please the heart of perumAL. They even make it a business where in they strike a deal with perumAL to get this thing done and they shall cut out a percentage to perumAL. Though this may look very funny, this is the state of affairs apparently today. But this is exactly the way one should not be in. It behoves us to remember AndaL’s who told perumAL, “Oh! My beloved Lord! “I have cooked akkAra adisil for you. If You come and eat this fully, you will get a gift. The gift is nothing but another 100 containers of akkAra adisil. I am giving the gift because You have come unto me and fulfilled my desire of eating the akkAra adisil cooked by me”. AzhvArs and AchAryAs sing glories to perumAL not because HE has killed the demons or evil kings and destroyed them. It is because they were afraid something might happen to perumAL during the fight and since HE emerged victorious and thus protected HIMSELF, they sing glories to perumAL and not because HE killed the demons who were threatening the very face of civilians in the country. thanakku engnganE seydhidinum To these type of bhaktAs (prapannas), perumAL is full of grace and HE does not even care for the mistakes they might do in their process of doing kainkaryam. All HE looks for is the heart with which he did and everything else is a non-entity to HIM. uchchiyAl ERkum ugandhu He will accept such a prapanna’s kainkaryam with much pleasure. Even if a prappannan had kicked out an object during kainkaryam, HE shall gladly take it and place it on top of HIS head. AndAL had adorned herself with a beautiful garland that her father periyAzhvAr had meticulously made for vatapathrasAyI perumAL. She wanted to decorate herself not for her own happiness but just to make sure that she is a suitable match for her darling krishnA. She stood before a mirror and saw herself when periyAzhvAr entered and caught her red handed. periyAzhvAr was very upset that AndAL had taken the garland and because of it , AndAL’s hair got onto the garland. Seeing this periyAzhvAr asked her to keep the garland aside and started to make a fresh garland from the scratch. He took this to vatapathrasAyI and offered HIM. When perumAL saw this new garland, HE became very sad that HE could not get the garland that was adorned by HIS devotee AndAL. So HE ordered periyAzhvAr to get him that particular garland that AndAL had worn because it had her hair on it and He wanted to enjoy only that. periyAzhvAr was pleasantly shocked and was very happy for his daughter. He went back and told the story to AndAL who become ecstatic on hearing it. Thus, we can see that even perumAL wants bhAgavatha sambandham. He wants only those that have the touch of a prapannan in some way or the other. He absolutely rejoices it and does not look for any demerits in them.